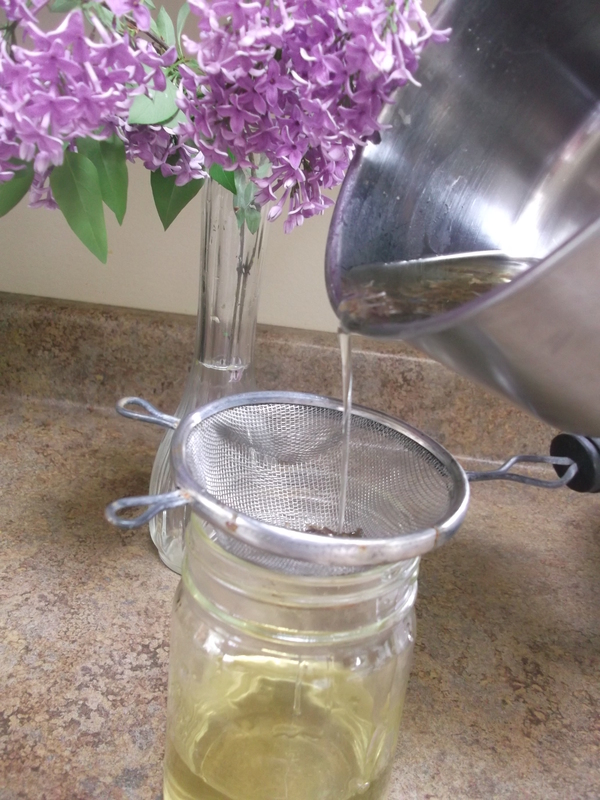 Here is an easy way to make a lilac flavored syrup that can be used like any other simple syrup in recipes, drinks, etc. Quantities can be varied; just be sure to use an equal amount of each ingredient (a good starting point that I used below is 1 cup of each). The first method is for a lighter syrup, and the second method is for a more robust syrup (pictured above). Keep syrup in a lidded jar in the refrigerator (or freezer) until ready to use. Use it like any other simple syrup or flavored syrup. It’s especially good in lilac lemonade (see recipe at the bottom of this post). Enjoy! Place sugar in a small saucepan and pour in the water. Stir to combine, and bring the mixture to a boil. Keep stirring and boiling until all the sugar has dissolved and the liquid is clear. Boil for about 10 minutes to reduce and thicken it a bit, then stir in the lilac blossoms. They will immediately wilt. Return the mixture to a boil, then remove the pan from the heat and let sit for 20-30 minutes, or even overnight. The longer the lilacs steep in the syrup, the stronger the lilac flavor will be. Pour the cooled syrup into a jar through a small strainer. At least 12 hours before making the syrup, make a lilac infusion: Tightly pack lilac blossoms in a jar and pour the boiling water over them. Stir and let sit overnight (or for at least 12 hours). The longer the lilacs steep in the water, the stronger the lilac syrup will be. To make the syrup, strain the infusion into a measuring cup and add just enough water to make 1 cup (or whatever unit of measure you’re using). Place the sugar in a small saucepan and add the lilac infusion. Stir to combine, and bring the mixture to a boil. Keep stirring and boiling until all the sugar has dissolved and the liquid is clear. Boil for about 10 minutes to reduce and thicken it a bit, then remove the pan from the heat and allow to cool. Here are a couple ideas for how to use this lovely floral syrup. I’d love to hear how you’ve used it, too! I made two batches of this to test it, but did I save the link to the recipe I’d followed? Sadly, no. I basically followed an online recipe for hard candy and in place of the simple syrup I used lilac syrup. You’ll want the most robust syrup for candy, or any lilac flavor gets lost. Follow the directions and make sure to heat it to the maximum temp recommended, or the hard candy won’t break apart quite as nicely and tends to stick to the teeth. After pouring the mixture onto a sheet pan, let it cool and then break it into pieces.